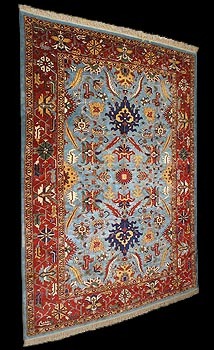 Dyes: 100% natural dyes: madder, weld (Reseda luteola) for green and yellow, indigo, pomegranate rinds. 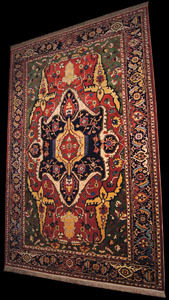 Design: The shaded madder red field with angular motifs and flowering vine around a grand central medallion enclosing a stylised floral centrepiece issuing palmettes and angular vine, shaded green spandrels similar, in an indigo blue border of "turtle" palmettes and angular flowering vine meander between red and ivory floral meander stripes. 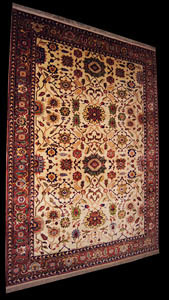 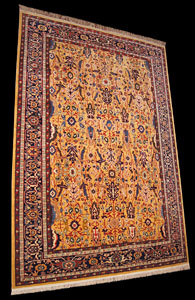 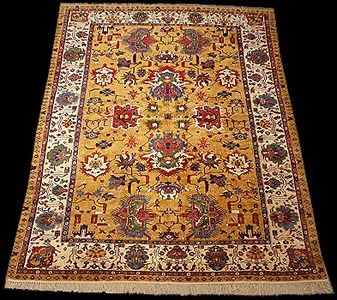 See an antique Serapi carpet with a similar design A Serapi rug with large palmettes connected by stylized vines on a striking ivory ground within a madder red ground polychrome "turtle" palmette and rosette border.